Create your own rock art with ancient symbols. Each symbol can be translated, rotated, and reflected. 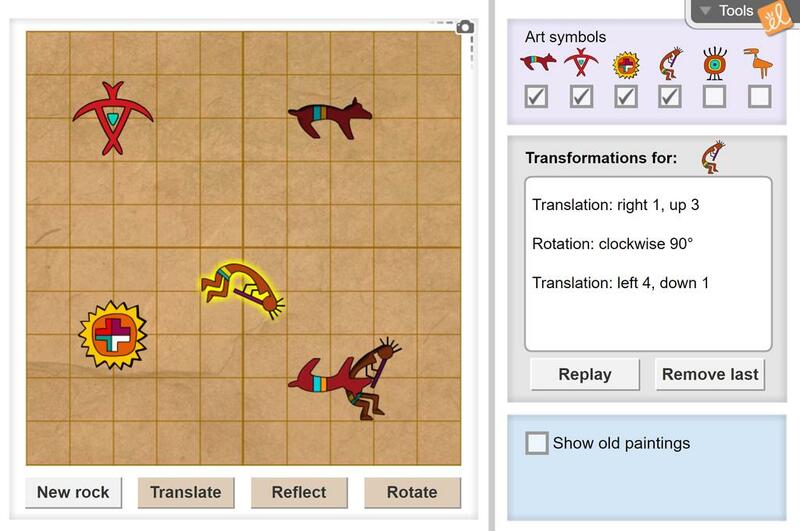 After exploring each type of transformation, see if you can use them to match ancient rock paintings. Recognize and describe translations, rotations, and reflections. Predict the result of applying one of these transformations to an image. Use transformations to manipulate an image. Given a preimage, identify transformations that will result in a given image. Provide different combinations of transformations that will result in the same image. This is a wonderful and colorful visual explanation of translations, etc. It makes it very easy for my ESE students to 'see'. Thank You!! I like to use this Gizmo for introduction and extension on Transformations.